This Test Guideline describes a procedure for characterising the bioconcentration potential of substances in fish, using an aqueous (standard and minimised tests) or dietary exposure, under flow-through conditions (but semi-static regimes are permissible). Independent of the chosen exposure method, the bioconcentration fish test test consists of two phases: exposure (uptake) and post-exposure (depuration). During the uptake phase (usually 28 days but can be extended), a group of fish of one species is exposed to the test substances at one or more chosen concentrations (depending on the properties of the test substance). For the depuration phase they are then transferred to a medium free of the test substance, or fed with clean, untreated feed. A depuration phase is always necessary unless uptake of the substance during the uptake phase has been insignificant. In addition to the test concentration, a control group of fish is held without the test substance. The minimised aqueous exposure test is not run over a shorter period than the standard test but comprises less fish sampling. The dietary exposure bioconcentration fish test is used for substances where the aqueous exposure methodology is not practicable. 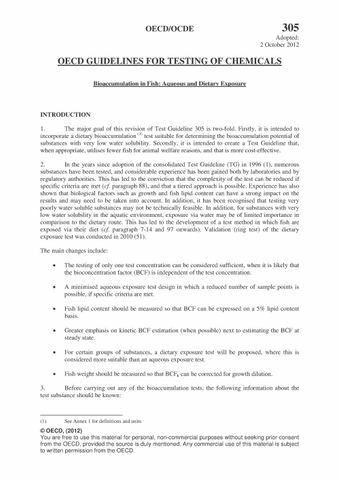 In the three test methods the concentration of the test substance in the fish is followed through both phases of the test: the aqueous exposure test yields a bioconcentration factor (BCF) and the dietary approach yields a biomagnifications factor (BMF); greater emphasis is put on kinetic BCF estimation (when possible) next to estimating the BCF at steady state. BCF and BMF are expressed based on the total concentration in fish, i.e. per total wet weight of the fish, and as normalized to a fish with a 5% lipid content.